Happy Chinese New Year! Today we celebrated by playing with red envelopes. I printed out some outlines for red envelopes from KidsCanHaveFun and cut them out. I also found some other sizes of plain red envelopes to play with. I couldn't find a suitable alternative to money (choking hazard) so we just had other toys and things that we put in and take out of our envelopes. Ethan really enjoyed this game, he brought his envelopes around to everyone to show them what was inside. 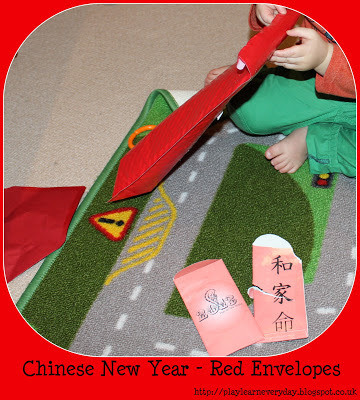 This activity was great for his Physical Development as he put things into the envelopes and his Knowledge and Understanding of the World as he learns about celebrations such as Chinese New Year.